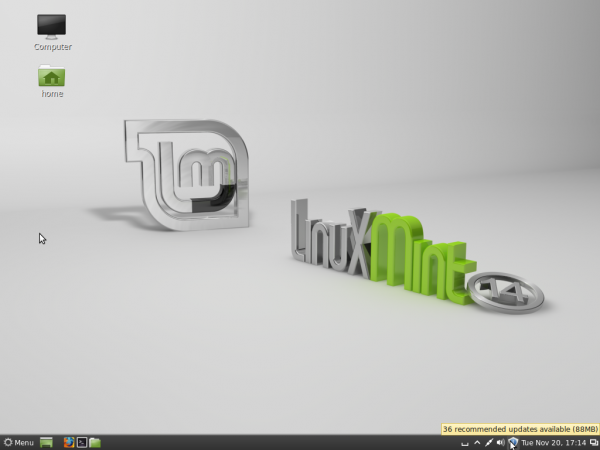 Linux Mint 14, code-named Nadia, is the latest edition of Linux Mint, a desktop distribution based on Ubuntu Desktop. Contrary to what the release number suggests, Nadia is actually the distribution’s seventeenth public release, coming almost six years after Ada, the first edition. Aside from the line based on Ubuntu Desktop, Linux Mint also maintains a line that is based on Debian. The last release of that line is available here. You may also read the previous tutorials and reviews on Linux Mint on the distribution’s category page at http://linuxbsdos.com/category/mint. 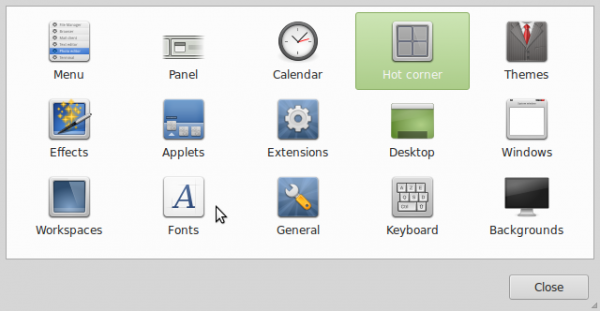 Cinnamon is a new desktop environment built atop GNOME 3 technologies. It is a project of the Linux Mint development team, and has been in existence for less than a year. Linux Mint 14 Cinnamon was released at the same time as Linux Mint 14 MATE. 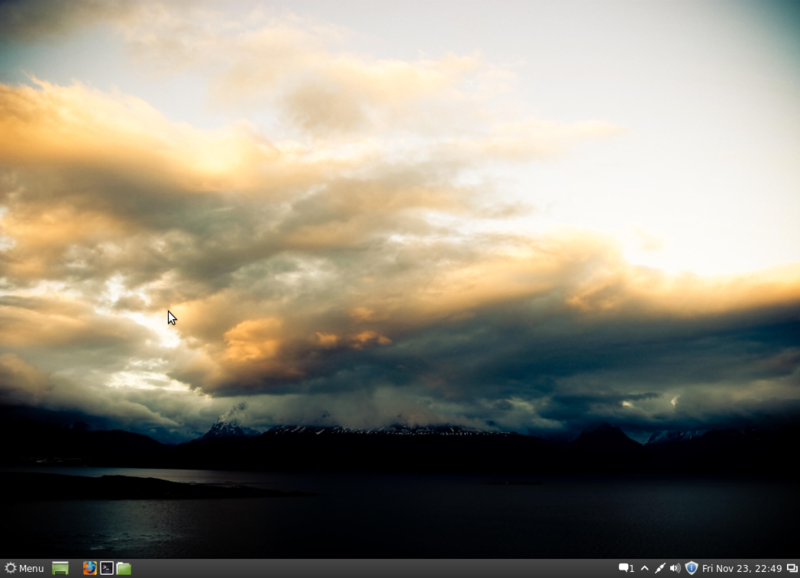 This article offers a review of the Linux Mint 14 Cinnamon. One for Linux Mint 14 MATE will come after this. …less than 10 days after the first Release Candidate was announced. What type of testing does this thing get? By the way, that’s normal for Linux Mint distributions, but again, how well is this distribution tested before it’s released to the public? Issue number 2 was the one I experienced on the test installations used for this article and in a machine I upgraded from Linux Mint 13. But the DNS issues was not just on virtual machines, it also affected installation on real hardware, where Internet access was painfully slow. Even after applying updates, the machines were still slow, though not as bad as before the respins. 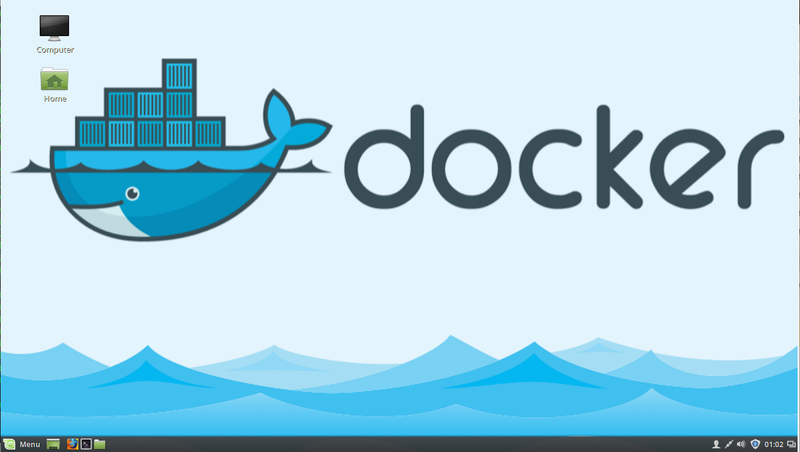 Internet access on virtual machines does not work, though other network connection, like ssh, do work. This screen shot was taken from a virtual machine installation after applying the respin updates. Error messages were more descriptive from the command-line. So whatever was fixed in the respins, still looks like it needs more fixing, especially in a virtual environment. Issue number 1 (high CPU usage) was likely more noticeable on low-end computers, so that’s why I did not experience it, and my UEFI computer boots into Legacy ROM mode, so that’s why I did not experience issue number 3 (failure to install grub-efi). But the Internet access issue was enough trouble. It was so bad on one of the test installations that rather than upgrade it using the system updater, I chose to install a new system using a respin image. Aside from the DNS issue (slow Internet access), another thing I observed when applying updates is shown in the image below. Note that these unauthenticated packages are not third-party updates, but core software available in the default repository. To me, that’s a major security concern. 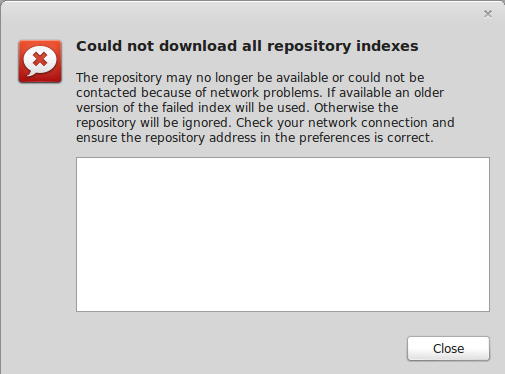 When attempting to upgrade a system after the respins were released with the sudo apt-get upgrade command, I got the following error message: E: Unmet dependencies. Try using -f. Applying the -f switch to the command fixed the problem, but then I got his message at the end: Warning: No support for locale: en_US utf8. One last issue on this subject. I’ve been running a test system on real hardware for about two weeks, and the system keeps reporting that the system is up to date. Knowing Linux Mint, I thought that was unusual, so I ran sudo apt-get update and apt-get upgrade. The last command showed that there were more than 100 updates available. Note that by default, the system is configured to check for updates at 15-minute intervals. With Linux Mint 14, it’s just one issue after another. For Linux Mint 15, the developers might want to make sure that it is thoroughly tested before pushing it to public download mirrors. 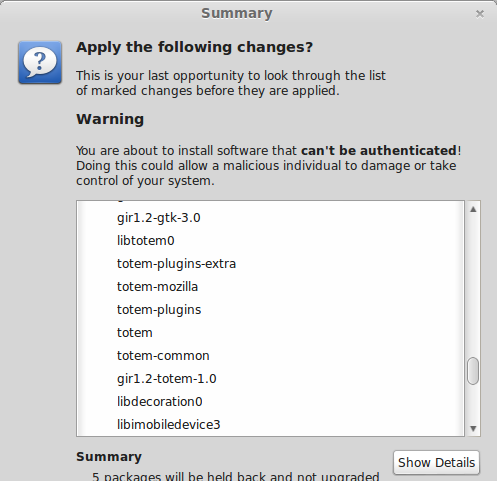 After installing the Cinnamon desktop on a test installation of Fedora 18 beta GNOME, the Session menu on the login screen had just two options – GNOME and Cinnamon. 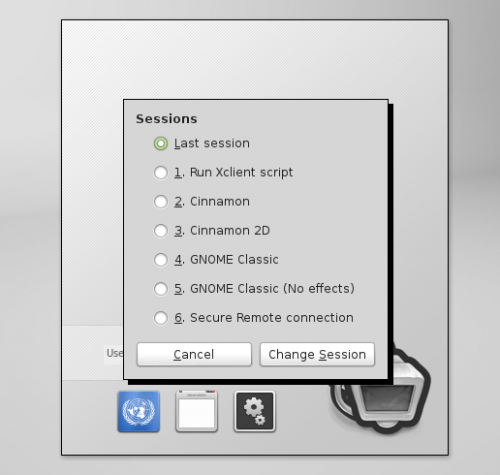 Contrast that with the Session menu of Linux Mint 14 Cinnamon. That’s a lot of options. For new users, it can be confusing. 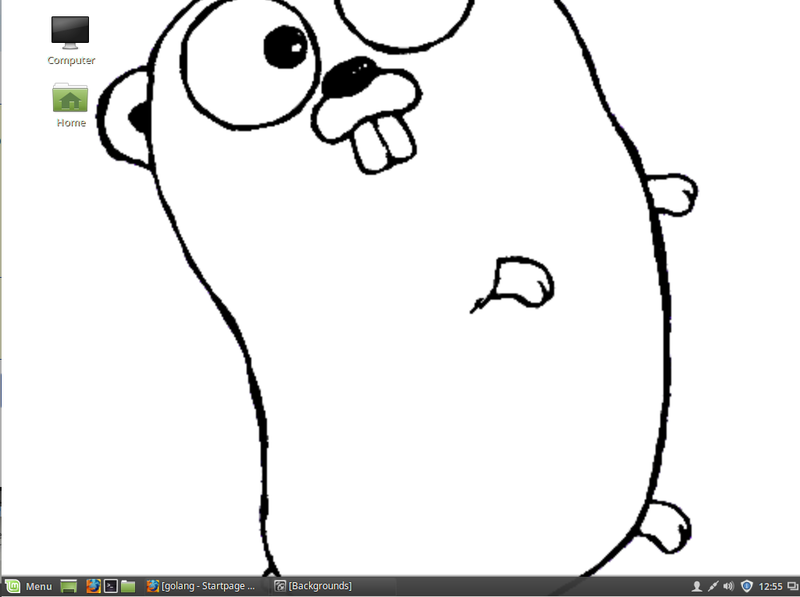 This is Linux Mint 14’s default desktop. I think the development team, and most likely, the person responsible for designing this branded-wallpaper, must think that this is the best wallpaper ever designed. It’s been the default wallpaper for at least the last four releases. Here’s a note to Clem and crew: It’s enough already. Retire this wallpaper. If you can give each new edition a different name, pick a wallpaper to match. There are much better ones available. Like this one, for example. Yes, I know, you can change a wallpaper in about three mouse-clicks, but the default is almost an eyesore. Yes, I know, beauty is in the eyes of the beholder, but that wallpaper should be retired. 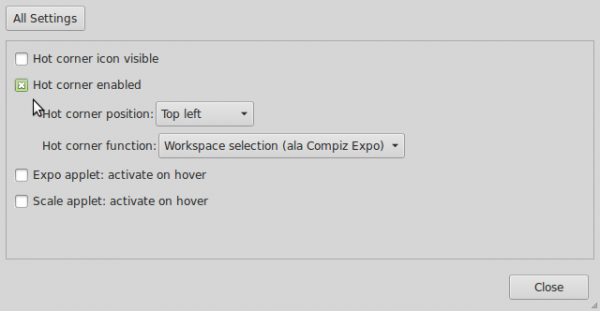 One of the best features of the Cinnamon desktop is that Cinnamon Settings, the hub for graphical management tools for the desktop environment, is not as confusing as the KDE equivalent. All you need to customize your installation of a Cinnamon desktop are accessible from this interface. For most users, the default setting will suffice. But one particular setting that I find very annoying is the Hot corner. It’s the first setting I disable after booting into a new installation of a Cinnamon desktop. That and other customizations you can make to Cinnamon are given in how to customize Linux Mint 14 Cinnamon. I disagree with the comment about changing the default wallpaper. The current default is sooooo much better than it’s sickly green predecessor that I’m delighted to see it, even if only for a few minutes before I get around to changing it to a picture I like. I consider the default wallpaper to be totally unimportant except to those that find it really discomforting. I found the earlier green a little discomforting, the old Ubuntu rusty brown horrid, but the colours on this one don’t bother me. Of course, that’s written as someone who changes the wallpaper shortly after installation. I love Cinnamon I tried it for first time Linux Mint Nadia Cinnamon 64 bit is pretty bit stable and using 350 MB RAM when idle which is somewhat good on modern hardware . I’m currently operating A linux systemunix Great 13 Xfce on two notebooks, and I have no objective of improving to 14 because 13 is a long lasting assistance edition. Anyway, I lately observed that Great Upgrade was not operating properly on my notebooks, so I suppose that the issue you encounted with Great Upgrade in edition 14 was also presented into an update of edition 13. It was set a few days ago. I don’t think you are supposed to sudo apt-get update and apt-get upgrade linux mint thats why they use safe updates using mint update. you turned it back to ubuntu.very clever of you. Thank you for an unusually critical review of Linux Mint. I’m currently running Linux Mint 13 Xfce on two laptops, and I have no intention of upgrading to 14 because 13 is a long term support version. Anyway, I recently noticed that Mint Update was not working correctly on my laptops, so I suspect that the problem you encounted with Mint Update in version 14 was also introduced into an update of version 13. It was fixed a few days ago. I’d also like to mention that I am also very tired of the default desktop. However, I have a much bigger gripe with the default color scheme as a whole, silver with a sickly lime green. Apparently someone at Linux Mint thinks that Mint should be associated with lime green, but any actual mint (plant) I have seen has deep green leaves, which would look a lot better with silver than lime green does. In my experience, mint is lime green only in cheap, artificially colored, ice cream and candy. It’s very rare for a reviewer to criticize the artwork in Linux Mint and I guess I’m venting on the subject because one of the things I have always done after installing Linux Mint has been to replace as much of the silver and lime green as I can.